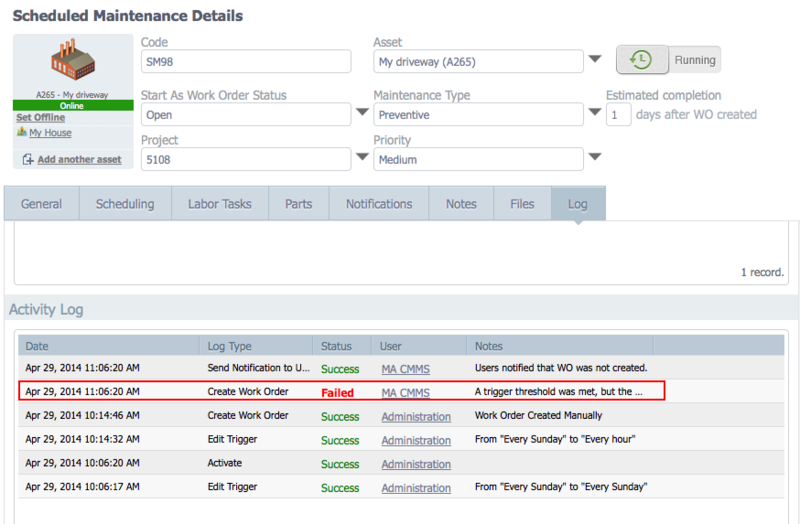 In the last month we have been incrementally updating the scheduling tab for scheduled maintenances in your CMMS. The updates give you improved and excellent visibility about when the next scheduled maintenance will occur. If you are not familiar with scheduled maintenance, then you should watch our 5 minute video on the topic. The video covers all of the basics including creating new scheduled maintenance, and setting triggers. In this blog, I will show the improvements that have been added since that video was produced. 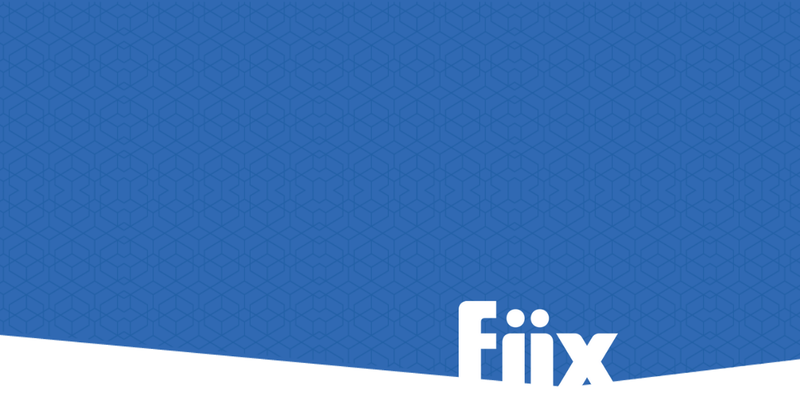 The first thing we have done is to improve the visibility on about when the next work order will be triggered from a scheduled maintenance. Regardless of if trigger is a time, meter or event trigger, we think it was important for our customers to be able to see when the next work order will be created. As an example, lets say you have created a time-based scheduled maintenance and want it to trigger a work order every Monday. You set the schedule to achieve your aim and then make the scheduled maintenance active. You might ask yourself, as a check, when is the next one due? To answer your question, the current time and the next trigger are shown in the scheduling tab of your scheduled maintenance. If you want to see all of the scheduled maintenances that are due, you can simply click on the hyperlink to see the dates and times that future work orders will be created. While the visibility has not changed since the video, the future dates are now shown behind the next trigger hyperlink, rather than in its own separate box. We have included visibility for the other triggers too. For example, another way to trigger scheduled maintenance is with meter based triggers. A vehicle is one example of an asset that would use a meter based trigger, to trigger a work order every 10000 km, for example. In that case, for improved visibility, we are now showing you the current meter reading value and the meter reading that will next trigger a work order. For additional visibility, clicking on the current meter reading hyperlink will take you to the list of all previous meter readings for the asset. If any of these meter readings triggered a scheduled maintenance they will be coloured yellow. These meter readings, because they triggered a work order are not delete-able. If you want, you can also add a new meter reading from this screen. Click the hyperlink to see previous meter readings. You can add new meter readings here too. 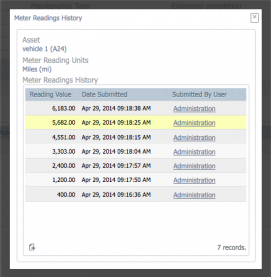 Yellow readings indicate that a work order was created as a result of the meter reading. This visibility is in addition to a new ability to set fixed or float meter based triggers. 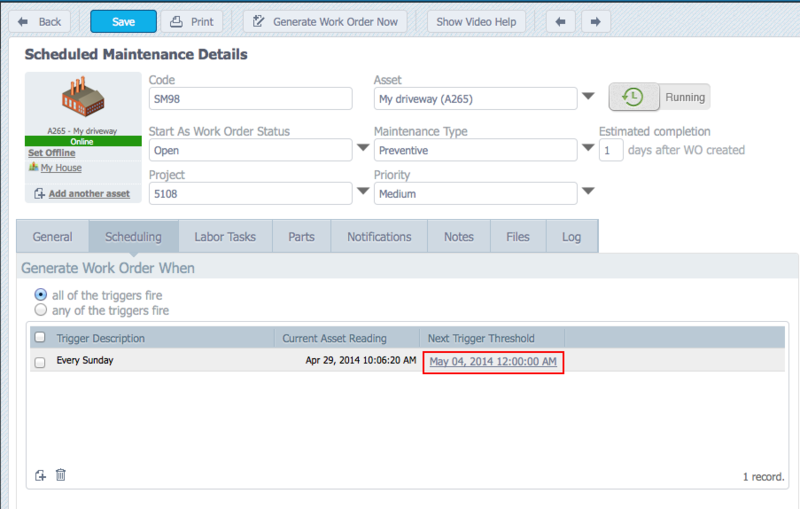 These will help you manage your scheduled maintenance intervals appropriately. Event triggered work orders are triggered every time a specified event occurs on the asset that is the subject of the scheduled maintenance. These too are displayed on the scheduling tab. 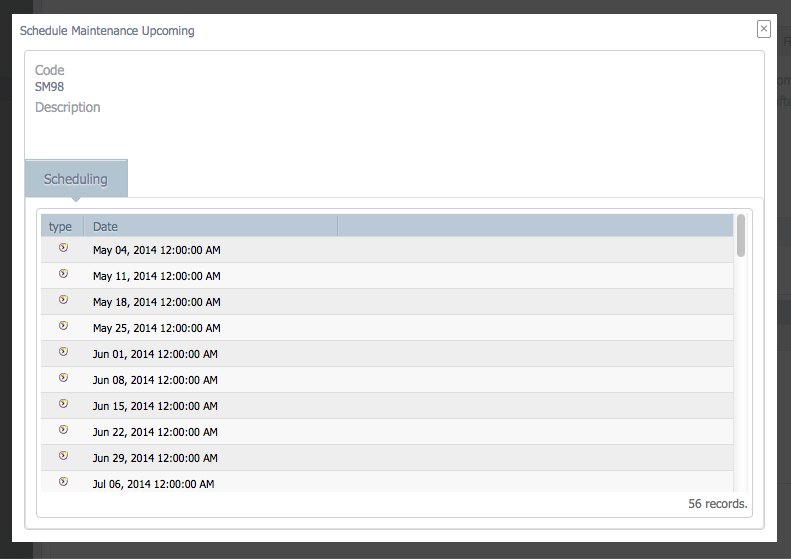 Event triggers need less visibility than their counterparts, they will trigger each time an event is initiated in the CMMS system. In addition to trigger visibility, we have been also incrementally improving the scheduled maintenance log. You can use this log to track most changes in your scheduled maintenances. Most events are now recorded for you to examine this history of your scheduled maintenance. This includes such things as every time a work order is created, or anytime someone changes a trigger, or anytime a work order is not created because one was already open is recorded. In the example below, you can see that I made a lot of changes on April 29 2014 between 10:06am and 10:15am including triggering a manual work order (this was as I was writing this blog). 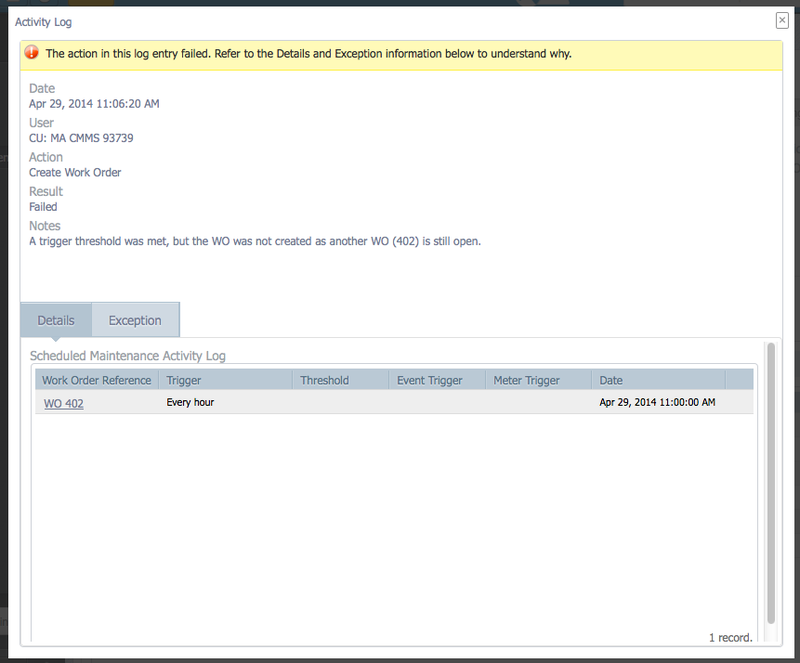 Then, because the manual work order was still open, it tells me that the scheduled trigger did not create a work order. When I click on any of these trigger events you can find out find information about it. The error notification will tell the reason a work order was not generated and point me to the conflicting work order. All of this information would be highly valuable when I am looking to document history or diagnose a problem. I think these improvements will be highly valuable to you as you set up your scheduled maintenance and begin to realize the savings that come from scheduled, rather than reactive, maintenance. Leverage the cloud to work better together in the connected age of maintenance and asset management. Proactive vs. reactive maintenance: What’s the difference—and can they actually work well together? Maintenance tips you can use. For free. Sign up for insider updates, news, and tips.